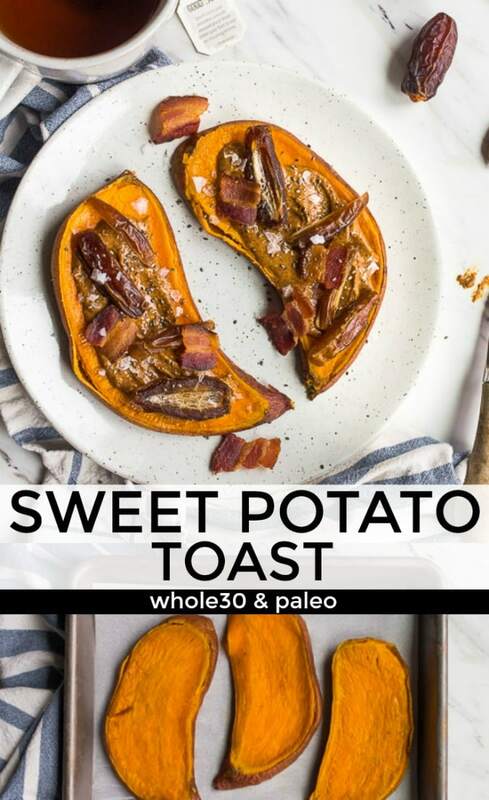 Sweet potato toast, my first Whole30 breakfast recipe as I delve into Whole30 for 2019! Hi, and welcome to my first Whole30. You’ve probably done Whole30 before, but this is my first year. I’ve resisted it for a long time because my job is sugar and I love sugar. Each year, I’ve made a list of reasons why I could never do Whole30, and the most compelling one is that you guys would miss my steady stream of Valentine’s Day recipes from January 1 to February 13. The truth is, every year, only 2 or 3 of those recipes ‘take off’ and become your favorites. So, I figured I could finally set aside an entire month to rid myself of sugar; I’ll spend the first 2 weeks of February furiously catching up on all things Valentine’s Day, deal? I’ve also thought that the idea of Whole30 is stupid because it cuts out foods that I know to be healthy (like my beloved grains), but I’m finally over that. I see the point of it. It’s about your relationship with food, not the actual food you’re eating. Did you read ‘It Starts with Food?’ It’s the guide to Whole30 and has wonderfully nerdy reasons to take the challenge. I’m one of those people that always craves dessert after dinner—something small and sweet. But lately, the dessert craving has been showing up after lunch. Twice a day dessert cravings tells me it’s time for a re-set. I’ll be sharing at least 4 new recipes each week for the entire month. Beyond that, you can search Pinterest for other amazing Whole30 recipes. I love that Whole30 recipes are always paleo and low carb, and as I noticed with my keto recipes, some of you guys are really into that! I’ve started with Whole 30 breakfast because if I start the day with a delicious breakfast I’m hoping to keep the sugar cravings at bay. Enter Sweet Potato Toast and Cauliflower Fried Rice (insert link). Though Cauliflower Fried Rice may be a little too savory for everyone, I love a warm, savory breakfast, especially when the temperature is below 50 degrees Fahrenheit. The truth is, small batch and the word ‘diet’ go together very well, so then Whole 30 diet shouldn’t be too much of a stretch. I’m also working to make these recipes fairly easy. I think it is important when trying something new to keep it as simple as possible. At the end of this month I definitely want to be able to file every recipe under Whole 30 Easy Recipes. For me it is difficult to keep up with what ingredients follow the Whole 30 rules, so I want my recipes to be easy to follow and provide something tasty so this is a diet I look forward to. 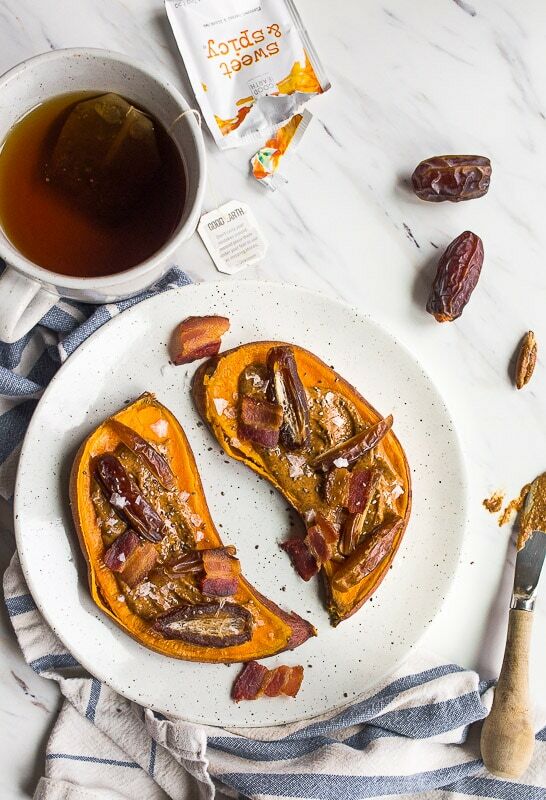 This Sweet Potato Toast with dates and bacon is definitely a breakfast I will look forward to. To successfully start Whole30, I had to arm myself with breakfast recipes, and I decided breakfast toast ideas would be a simple way to start. I mean Avocado toast was just an idea once and look at it now! While you can always count on me to make healthy dinners for two, breakfast is always my weakest meal of the day. Most of the time, breakfast is tea with protein powder, the rest of my daughter’s breakfast, or toast. Hardly filling, hardly nutritious, and not enough to get me to lunchtime. So, the success of Whole30 for me depends on amazing breakfasts. Oh, and fun fact: I don’t love eggs or meat, especially in the mornings! I know that most Whole30 breakfasts rely on eggs and meat, so immediately, I came up with other plans. I’ll admit that the idea of using sweet potatoes as a substitute for toast sounds insane. But, once you go through a few days on Whole30 and realize that you crave sweet in the morning, it starts to sound absolutely delicious. When you realize that the small squirt of honey in your tea is the sweetness you need to wake up, and suddenly you are without it–sweet potato toast sounds good. And it is good; it really is! If you never jumped on the Avocado Toast bandwagon, well here is your chance to get in early on Sweet Potato Toast. Sweet potato toast isn’t exactly how it sounds; we don’t put thinly sliced sweet potato in the toaster. Well, we do eventually, but not in the beginning. First, the 1/2″ thick slices of sweet potato are baked in the oven. This serves two purposes: even baking in the toaster and a great make-ahead breakfast method. Grab a sweet potato that is fairly thick and rotund. I don’t use the skinny ones for toast. Wash the skin very well, and then use a knife to cut as many 1/2″ thick slices as you can. I get 4-5 slices per sweet potato. Lay them flat on a baking sheet lined with parchment paper. Drizzle lightly with avocado oil on both sides. Bake at 400-degrees for 15 minutes, flip and cook for another 5 minutes. Let the slices cool, and then layer between wax paper in an airtight storage container. Refrigerate until needed! To make the breakfast toast, pull out 2 slices of already cooked sweet potato, slide them into the toaster (or toaster oven), and two cycles on medium heat will give you warm, toasty sweet potatoes worthy of toppings! There you have it, sweet potato toast in the toaster oven. 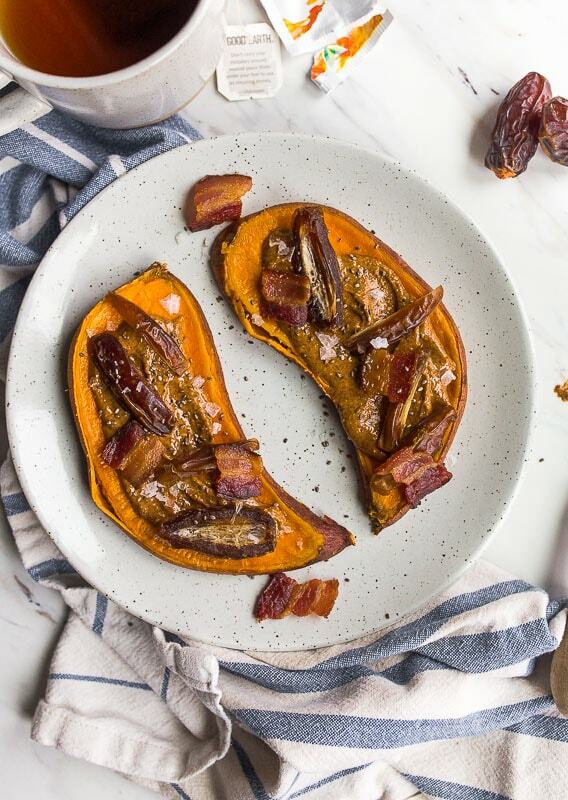 My favorite way to top sweet potato toast is with the salty combination of dates and bacon. The smear of almond butter makes it hearty and filling. By all means, top your sweet potato toasts with whatever Whole30 combo you love: avocado, fried eggs, compliant yogurt, anything you like. The chia seeds provide some crunch, but unsweetened coconut flakes and flax would be great, too! This breakfast toast is a great Whole 30 way to start your day. Yep, that was super corny, but it’s 2019 and I’m on a diet, so I’m trying not to take myself too seriously. 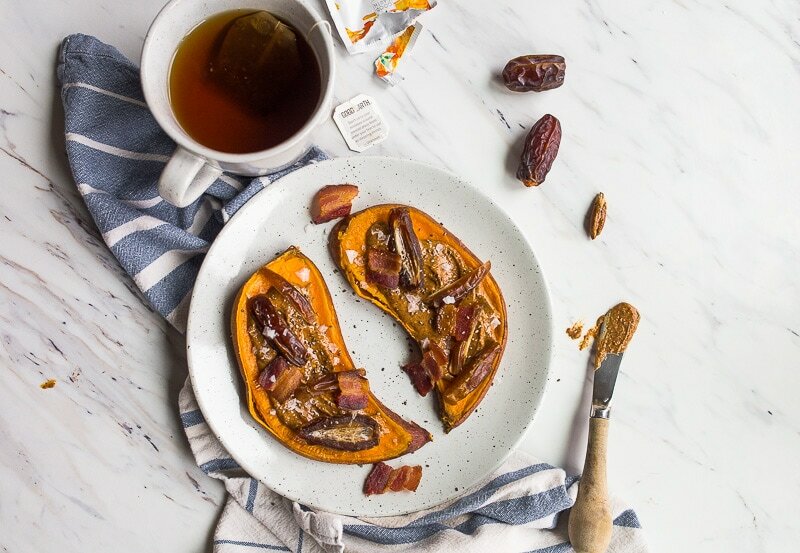 Whole30 breakfast idea: sweet potato toast with salty bacon and sweet dates. Place the bacon slices on a baking sheet and slide them into the oven on the upper rack. Wash a sweet potato very well, and then using a sharp knife, slice it into 1/2" planks. See photo above for reference. I leave the skin on. 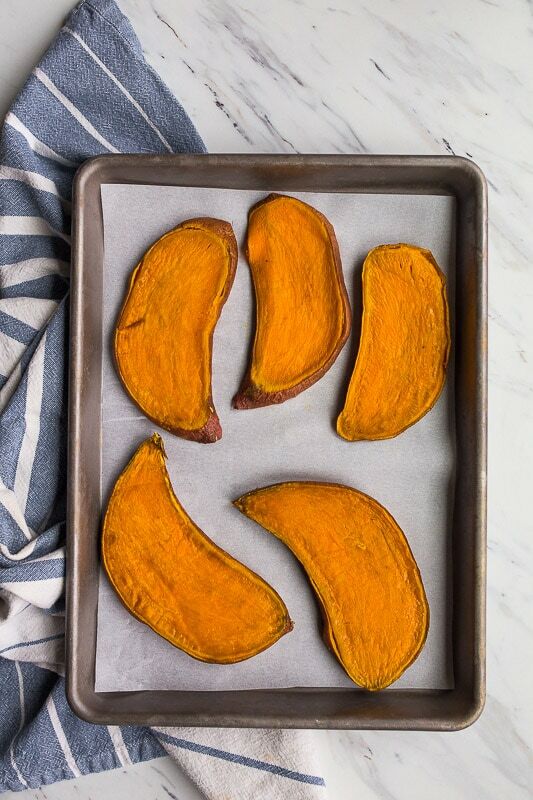 Arrange the sweet potato slices on a parchment-lined baking sheet, and drizzle with the avocado oil. Turn the slices over to coat both sides lightly in oil. Bake the toasts on the upper rack for 15 minutes; flip and bake another 5 minutes. Check the bacon after 15 minutes--it's done when it's dark red and will crisp as it cools. Let the sweet potato slices cool on the baking sheet. Wrap them between pieces of wax paper and store them in the fridge for quick breakfasts. To make sweet potato toast for two, place 4 cold sweet potato slices in a toaster or toast oven, and toast until warm and just starting to crisp around the edges. Some brown spots are fine. When the toast is done to your liking, divide the almond butter, sliced dates and bacon between the toasts. Top with flaky sea salt and chia seeds, if desired. Really looking forward to your recipes this month. I also have a job immersed in sugar but this is my 3rd Whole30 and it always makes me feel so good by the end of the 30 days. I also can’t tolerate eggs first thing in the morning so always struggle a bit for the first week or so. Once my sugar levels sort themselves out I actually find it easier to fast a few mornings a week since I’m not craving a pick-me-up. 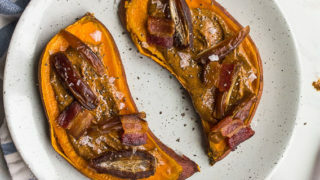 Love the idea of sweet potato toast! Oh, as I could not survive the Whole30 without spiking my morning tea with gelatin and homemade almond milk!! Good luck for the next 30 days!! My first round I ate almost 4 dozen eggs in 4 weeks. I didn’t want to see an egg for a long time after that. 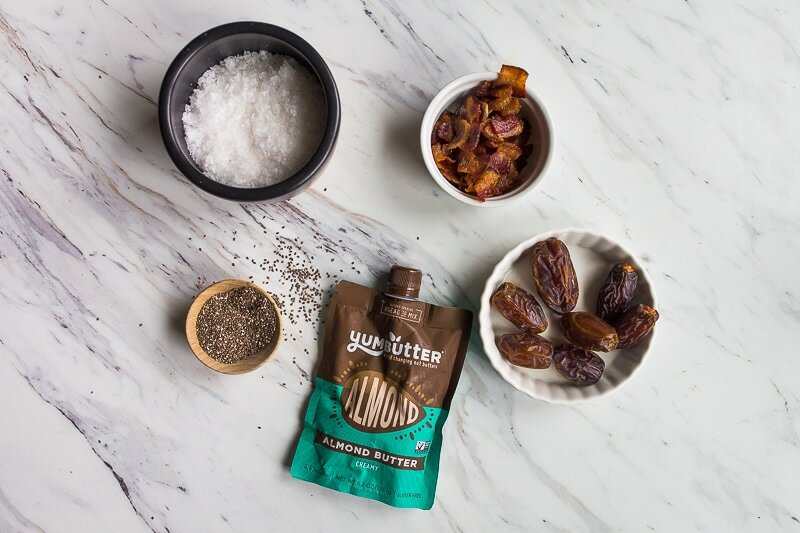 I love the idea of bacon, dates and almond butter. Good luck. I am rooting for you. Holy cow – this is perfect! I almost didn’t open the email because I knew you would be likely to lead me astray from this no sugar/no grain thing I’ve gotten myself into. As it turns out – YUM! I can’t wait to try this out. I’m not doing Whole30 for all the same reasons you’ve been using, but it’s close enough that I don’t need to modify any Whole30 recipes to be compliant. It’s super helpful to have this resource from someone who’s taste-buds mirror mine. Awwww, Colleen! I’m so glad you did too :) You’re so sweet!